I have had many bespoke commissions from my clients to make engagement rings, wedding rings, replicating heirloom pieces of jewellery, re-modelling and incorporating precious heirloom pieces into a more modern, contemporary setting and more. I work with you to discuss what it is you have in mind and how best to create it. You may have a strong idea of what you want, or you may have just an element of a design which can be incorporated into the final piece. I love working with my clients to create something that is special and meaningful to them – something that they have had a part in creating. This bangle was a special order for the sister of my client. Her children’s names are etched on the inside edge of the bangle which is surrounded by 18ct gold spinning bands. One of her children had a life-threatening disease which, thankfully she has overcome. 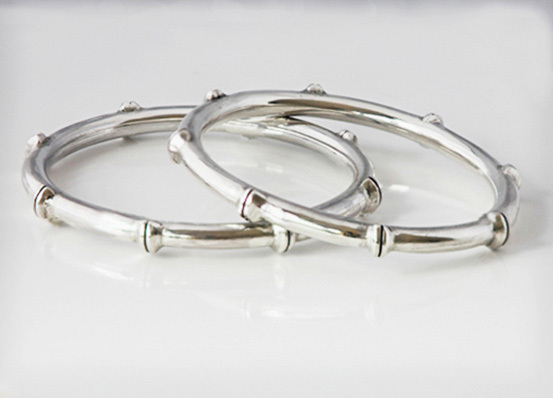 The sterling silver bangle has gentle waves and curves in which the gold bands sit. When the bangle moves it makes a very sweet and gentle tinkling sound. A very special commission for a special family. 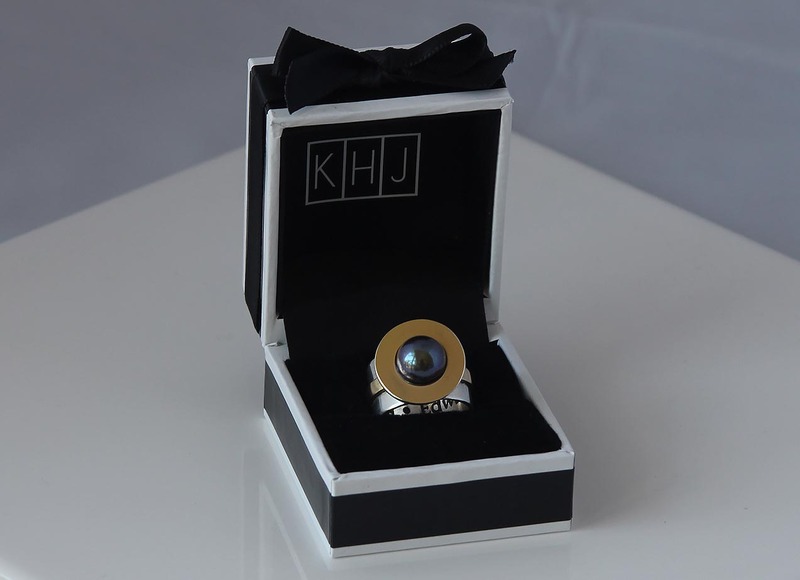 Here is one I worked on recently – An ‘Asking Ring’ in sterling silver and 18ct gold band with a black pearl sitting in an 18ct gold halo dome. He asked – she said yes! I love all this romance. I was approached by a lovely couple at one of my local markets that I love doing. They wanted rings for each other as symbols of their love for each other. They didn’t want matching rings, but matching etching on the inside was their only request that would make the rings a pair. She loves stars and wanted them incorporated into a spinner ring. 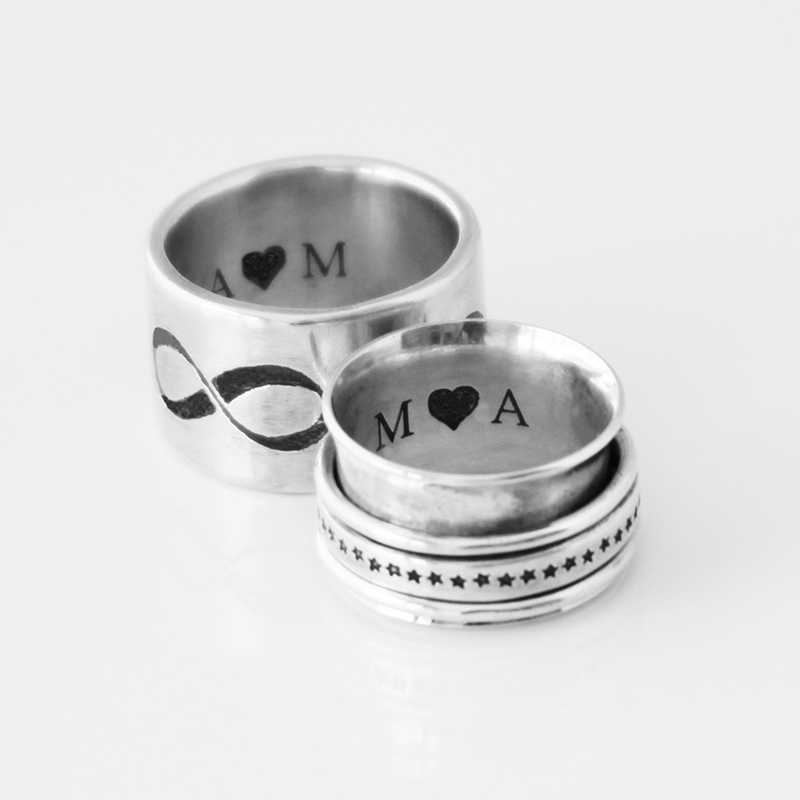 He wanted a big, strong ring using infinity symbols to represent their love. I just love a good love story! A lovely client of mine contacted me with an idea of creating a set of family heirlooms. Wendy’s 95 year-old mother Mary had recently moved into aged care. For most of her 95 years Mary has worn two precious heirlooms of her own – two Silver clasped Bamboo Bangles that once belonged to her own mother. 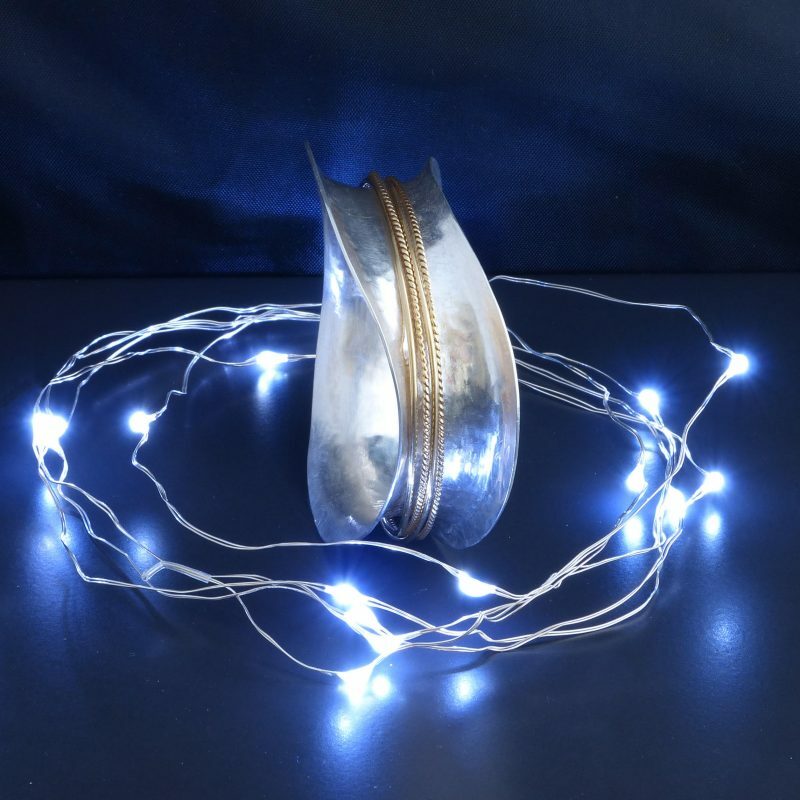 Many years and many repairs have seen the bangles’ clasps soldered closed, but considering their age, and the fact that Mary and her mother have worn them so often, for so long, they were in pretty good condition. Wendy wanted each female member of the family to have a bamboo bangle like Mary’s – a special link for each of them to their much loved mother, mother-in-law and grandmother … a special link also, between each female member of the family. I was asked to create a feather ring for a gift for the daughter of a couple who had collected a Red-tailed Black Cockatoo feather many years ago. The colours of the feather had faded somewhat and the condition was poor. 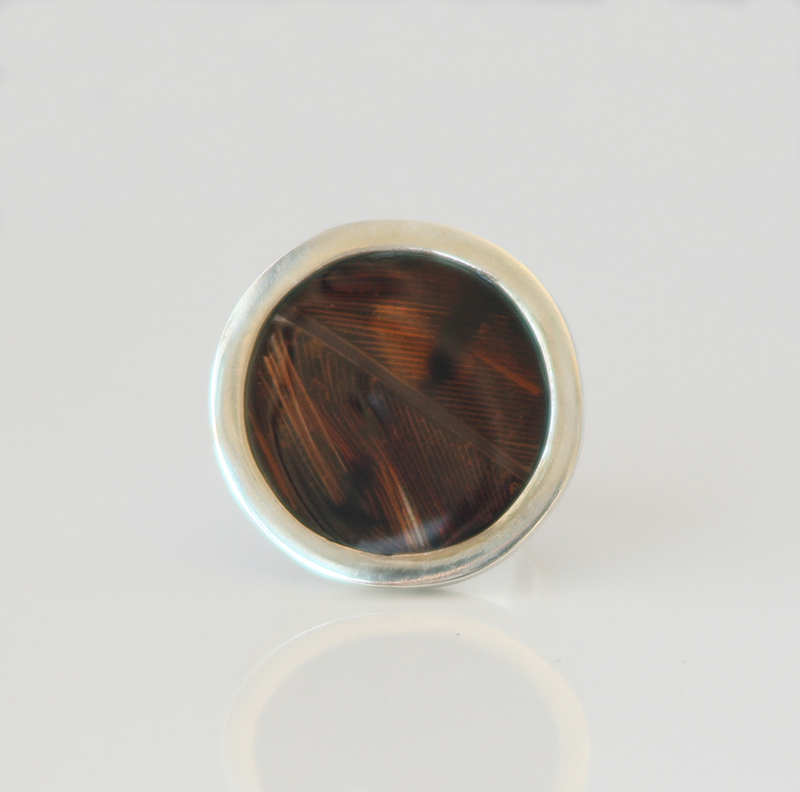 However we managed to make this little feather into a beautiful ring for their 18 year old’s birthday. It has been a bit of a cut and pasting job, however has resulted in a beautiful piece of jewellery which will be treasured because of the story behind the feather. The colours remind me a little of tortoise shell.